Take a moment to reflect on the grandmothers, mothers, daughters, wives, aunts and sisters who are your neighbors, mentors, bosses, employees, investors, first responders, teachers, partners and friends. How our world would be different without them! Today we’d like to introduce you to Jan Kingaard and Amber Hughes. Mother-daughter entrepreneurs Jan and Amber have expanded their 16 -year-old business from cars to causes. The core mission of their Costa Mesa studio is to help individuals, businesses, organizations and institutions honor, recognize and commemorate the people and occasions that are important to them. With their small team of family members and experienced bow builders, the teams make huge bows for cars, Gold Star and Breast Cancer Loops, ribbon cutting and building bows, and just about anything you can imagine. They love the business which gets them to step outside the day-today activity most people are so busy with and pause to enjoy a moment and make it memorable. There are many reasons to celebrate and if you can’t think of one, King Size Bows can. It took many months for the new owners to learn the tricks of the trade, resources, processes, market and customers. Jan did all the talking the first year while Amber focused on new styles and possibilities. Division of duties came naturally, playing to each woman’s strengths and experience. The growth of the boutique business depends on their growing skills with tools, software, materials, techniques, vendors, equipment, online selling, shipping and handling. So many details that the hours speed by. So, let’s switch gears a bit and go into the King Size Bows story. Tell us more about the business. You’ve no-doubt seen their work in the Lexus “December to Remember” commercial; atop a pony on a cruise ship for the California Lotto; throughout the Dolby Theater for America’s Got Talent Holiday Special; on buildings and lampposts throughout the US and Canada, as well as homes, retail stores and auto dealerships. Their unique boutique also ships internationally. Their line includes “In-Stock” and “Custom” bows. In-stock bows are kept in inventory for shipping immediately; custom bows require time to create. Their classic red Signature Bow was created by the studio’s original owner in 2001, and is now available in red, royal blue, navy blue, silver, white, pink, black and gold. For $50 plus shipping, any vehicle, appliance, home or large gift will provoke delight in the recipient. There’s something about a big bow that shows deep appreciation and thought in gift-giving. The photogenic art pieces are must-have selfie shots to share on social media sites. Bows under 30 inches are made of die cut high quality paper or plastic. Custom fabric bows are anywhere from 3 feet to 20 feet, depending on the style. For 16 years, King Size Bows has lived up to its name—fit for royalty and huge. Only a handful of businesses sell bows in the US, and most of those are imported and styles are limited. Very few make bows larger than 3 feet, and KSB’s quality and variety are difficult to match. More than half their orders are made to customer specifications. They sometimes make matching wrap to make an exhibit, building or car look like a present. Their imagination seems limitless. They have made bows for costumes, a stripper, real estate developers, fire trucks, boat, helicopters, motorcycles, washing machines, billboards, state capitols, birth announcements and wedding proposals. I guess you could say both bad and good luck have played a role in this business. Mother Jan’s business experience spans decades as a startup business and marketing consultant. King Size Bows was one of her clients. The founder of KSB was a serial entrepreneur and when she was ready for her next venture, Jan bought the bow business. Daughter Amber’s career with the Sheriff’s Department as a 911 Operator ended abruptly after a near-fatal car accident left her speechless. She has always been creative, making her prom dresses in high school, and had spent several years in retail and medical industries. Fortunately, she has recovered her voice with surgery and voice therapy, and is the driving force for the business expansion. Santa’s got his sleigh. Rudolph his red nose. And Lexus its giant car bows. Every year, these hallmarks of the holiday season float into our lives, wrapped in red velvet and good cheer, and we herald their arrival with songs, stop-action TV specials and elaborate ad campaigns. But if the stories of Santa and Rudolph are stitched into our stockings – and the fabric of the holiday season — the genesis of the giant car bow is a bit more elusive. So we enlisted a few automotive elves to help us unfurl 10 little-known facts about giant car bows. Lexus’ unforgettable ad campaign: In 1998, the luxury carmaker debuted the big bows as part of its “December to Remember” commercials, and no matter how implausible it seemed to get a $35,000 Lexus as a gift, the pure whimsy of loopy red bows plopped on top of car roofs captivated viewers. December has since become the best sales month for Lexus–in 2016, the luxury carmaker sold 41,182 vehicles, 10,000 more than its second highest month (August). The ads are also credited with helping transform December from one of the slowest times of year for auto sales to one of the most vibrant, replete with holiday closeout sales and Black Friday specials. Big bows for showrooms and beyond: Lexus provides a few bows to each showroom, but to the surprise of some buyers they’re not included with the purchase of the car. (Handmade fabric bows can cost $600; high gloss paper or PVC bows start around $40.) Some Lexus dealers let buyers borrow the bows for the big reveal, and include that in negotiations. 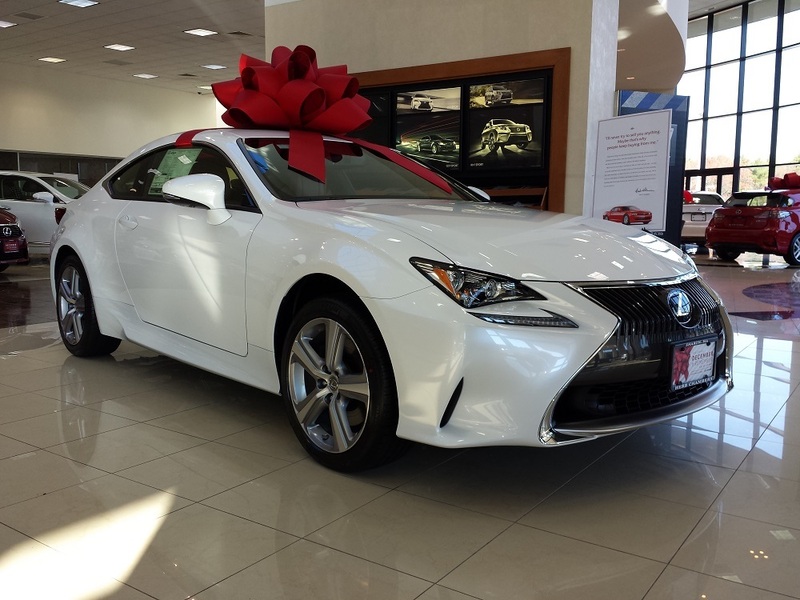 But as the popularity of car bows blossomed, dealerships beyond Lexus began using them in their holiday showrooms, and car buyers who wanted to keep the bows created even more demand. The queen of King Size Bows: In 2000, Lynda King decided she wanted to surprise her daughter with her dream car, a VW Beetle, with a giant bow on top. But she couldn’t find a bow big enough, so she made one herself. After seeing her daughter’s reaction, it sparked a business idea. King Size Bows was born in her home in Costa Mesa, Calif. Dealers bought most of the bows at first, but in 2003, Lexus came calling and after appearing in the December to Remember campaign, King’s bow business boomed. You get a bow, and you get a bow! : In 2004, Oprah Winfrey famously made 276 of her audience members’ “wildest dreams” come true, when she gave each of them a Pontiac G6 with a King Size Bow on top. Since then, giant bows have made nearly as many TV appearances as Oprah, popping up on daytimers like Ellen and Steve Harvey, game shows such as America’s Got Talent, The Price is Right, and Let’s Make a Deal, and prime-time hits like Modern Family, Empire, Bones and many more. Watch for a King Size Bow on an upcoming holiday episode of The Mayor. The big bows even earned a spoof on a Saturday Night Live. In a mock ad, Seth Meyers gets a brand new SUV from his wife (Amy Poehler), but he turns his nose up at it because there’s no oversized bow on top. Big bows, the DIY edition: Google “big car bows on Pinterest” and you’ll get nearly 18 million results. So while Car Bow Store and King Size Bows are the big kahunas in the market, plenty of people are taking to social media and YouTube to share their DIY secrets. If that’s a bit too ambitious for you, big bows are also available at Party City, Amazon and Michael’s for $10-$60. Ever think about who has to make those giant bows you see in commercials and in new car showrooms? They’re the specialty of a company in California. They supply the trademark bows you see in Lexus commercials, but they’ve produced the festive knots for a dozen other manufacturers, too. Holiday sales are a vital part of the profitability of automobile manufacturers. The most visible push automakers put on occurs from roughly the Thanksgiving holiday through Presidents Day in February. Almost every automaker’s and dealership’s marketing plan falls back heavily on one image: Their newest models with a huge red holiday bow on top. As it turns out, those holiday bows have an interesting backstory. Pancreatic cancer is the third leading cause of cancer-related deaths. Over 145 Americans-family, friends, neighbors and colleagues, are diagnosed every day. The disease kills more people than breast cancer in the United States. We must rewrite the future of pancreatic cancer. Take action now to bring hope to the pancreatic cancer community by donating, raising funds or spreading awareness that of the major cancers, pancreatic cancer has the lowest survival rate. Support such groups as the Pancreatic Cancer Action Network who work for improving survival from pancreatic cancer by 2020. Display purple this month and Wage Hope today in the fight against pancreatic cancer. June is National Cancer Survivors’ Month! June 4, 2017 starts National Cancer Survivor Month, an annual Celebration of Life held in hundreds of communities. The special occasion is an opportunity for the families, friends, medical professionals and 15.5 million cancer survivors to connect with each other to stimulate knowledge, funding, and research for breakthrough treatments. It is the one day each year when people around the world join together to honor cancer survivors. “A ‘survivor’ is anyone living with a history of cancer – from the moment of diagnosis through the remainder of life,” according to the National Cancer Survivors Day Foundation, administrator for the celebration. “We work with health care centers, retailers, contractors, businesses and non-profit groups to get the word out about colon, leukemia, breast, prostate and other types of cancer,” said Amber Hughes, president of the custom bow design studio. “These ribbons draw attention to this important cause as an emblem of empathy and support. They are an invitation to be part of something big.” This annual event is a day to draw attention to the ongoing challenges of cancer survivorship in order to promote more resources, research, and survivor-friendly legislation to improve cancer survivors’ quality of life. The universal message of awareness ribbons is thought provoking and deep felt: “Together we can,” they say, and, “Thank You” to supporters and healthcare givers. Businesses use the giant ribbon to show their support of employees, healthcare givers, organizations and researchers; individuals for friends and loved ones. Hughes’ favorite meaning is “Congratulations and Fight on!” to survivors and warriors battling the disease.